Many people have an old and unreliable electric service panel installed in their residence or office. You might be interested in getting a new panel installed but are concerned about the cost or time required. However, the process is quite simple; which means it won’t inconvenience you or cost lots of money. 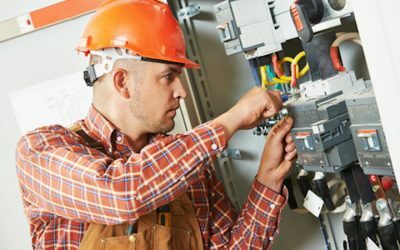 In this article, we will give you an overview of the installation process so that you know what to expect when you have us put in a new electric service panel. The first step we will take when installing a new panel is to remove the knockouts. A knockout is a small, partially stamped opening in an electrical box that allows for quick addition or removal of wires or other components. Removing the knockouts will allow us to install the electrical connectors. Taking out the knockouts does require the use of pliers but will not damage your wall. Once the electrical connectors are in, it’s time to install the panel. The panel should have holes in it to accommodate screws. Most panels are about the same size, so the holes left by the previous panel should fit the new one. If they don’t, we will have to drill holes to ensure the panel can fasten securely to the wall. Next, we will connect the panel to the electrical box we are attempting to feed. This part will probably be a two-man job, as one person has to feed the wires through the panel and another has to connect the wires to the box. This part may take a while if the electrical box is tough to access. Now that we’ve connected the power box to the panel, it is time to wire it up. First, our electrician will safely strip the wires using a specially designed wire stripping tool. Next, he will connect each wire to the proper connection. There may be upward of 30 wires to connect, so this part can take some time. If you like, we can use a numbering kit that tells you which wire goes to which circuit. We will bend the wire before connecting them to the circuits to ensure that the wiring looks presentable. If you’d like us to install a new electric service panel or if you just have a question, you can call us at (770) 680-2144. We’d be happy to help you out in any way we can. Our electricians are highly trained and experienced, and you can rest assured we know what we’re doing. We are located in Alpharetta, Georgia and will happily come out to anyone in our service area.